I hate to admit it, but I walked into this movie cursing myself. "Here we go again. Another rehash of a super hero that has been done a million times." 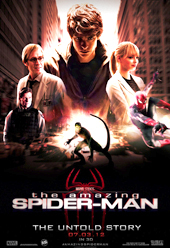 The funny think is walked out of the theater saying, "about time someone did justice to Peter Parker." Don't you just love it when a movie both proves you wrong and awakens you to bigger and better possibilities? I'm not saying this is anywhere near Christopher Nollan's universe. But, what a cool movie this was. Awesome script, phenomenal direction work, and enough effects to support the story without turning it into another amusement park ride. The only scene that I had hoped not to find in the movie is the one when they line up the construction cranes. A touch of Hollywoodese. We'll look the other way on that one. It is a studio picture after all. In general, I very much believed the story and the characters. Everyone was riding a good balance between what life deals them and the sacrifices behind changing our own fate. What a script. You even feel bad for the bad guys in this. Andrew Garfield was a great voice for modern teenage angst, and Emma Stone was equally significant. Great pair to front this. Everyone else felt like the perfect piece of the puzzle. Although I have a feeling the majority of the kudos on this one should go to a flawless script and surgical camera work. This is what happens when talented filmmakers get together and decide to turn the camp in comic books into a real life drama. Congratulations. I'm sold!